Alice Bailey was born Alice Ann La Trobe-Bateman on 6th of June 1880 in Manchester where her father was working on an engineering project in his father’s firm. The family were very well connected and of the upper classes of the times with lineage going back to before the Crusades and with a family crest. Until 1908 she wanted for nothing and as a baby was taken to Canada with her parents as her father was involved in the Victoria Bridge building over the St. Lawrence River. The family went to Davos in Switzerland for her mother’s health but she died in England at the age of 29 when Alice was only 6 years old. In fact by the time she was 9 she had lost both of her parents to tuberculosis - the dreaded consumption. From then on she was looked after by the extended family, initially by her grandparents who lived in Manor Park, Surrey. There was great discipline in her and her sister’s lives with a series of governesses. After her grandfather’s death she lived in London with her grandmother until the age of 13. Alice travelled much in France and was used to staying in the best of country houses in Scotland, Ireland and England. Alice says that she suffered from “constantly recurring misery” and before the age of 15 she had made three albeit minor attempts at suicide. Although she had no money worries in her early years, she was taught that money and position entailed certain obligations which just had to be met. However, she admits that she had a terrible temper. Alice was brought up as an orthodox theologically minded Christian but on 30th June 1895 when she was staying with an aunt in Kirkcudbrightshire she had a visit from an eastern gentleman in a suit but wearing a turban whom she had not met before. It was a Sunday and her relatives had all gone to church and she was alone in the house with the servants. Only many years later did Alice discover that he was the Master K.H. - Koot Humi. He told her that she had to change to do the Master’s work. She had to be nicer and learn to control her rather violent temper. At that time she had never heard of the existence of the Masters so she presumed it was Jesus. However every seven years until she was 35 Alice reports that she had indications of his supervision and interest. At the age of 18 Alice went to a London finishing school. Her education was a good classical one with enjoyment for her in history and literature. Then she went to her guardian near St. Albans where she taught for the very first time in a Sunday School. She reports that she led a completely disciplined life - disciplined either by people or by the conventions of the time until she was 20 years of age. However she suffered from religious adolescent miseries. Until Alice was 22 she also says that with her sister they lived the lives of society girls with three “London seasons”. Alice became an ardent Y.W.C.A. worker and began a new cycle of work as an evangelist among British troops. At this time she was a dyed-in-the-wool fundamentalist and worked in the Sandes Soldiers Homes in Ireland and India. She took Gospel Meetings and learnt eventually to speak well to a large audience after she had overcome great initial difficulties. Alice met and fell in love with Walter Evans but in 1906 she began to break down physically as she had taken on too much responsibility. Also she was questioning her beliefs and then there was the problem that Evans was her social inferior. She felt that she was letting down the work and making things more difficult for her fellow workers. So she ended the relationship. However she was so ill that she went back to Ireland. Then she travelled to Scotland where another “aunt” paid for Evans to go to the U. S. to train in the Episcopal Church so that his social standing could be improved and they could then be married. Alice suffered from bad migraines and thought she had a tumour in the head. She was told by a London neurologist to go to bed for six months and sew, which she did and in that time she recovered very gradually. The next seven years were to prove extremely difficult economically, physically, emotionally, mentally and spiritually. Alice and Evans married then went to Cincinnati, Ohio where there was a seminary for Evans to begin his training. They had their first child, Dorothy and then went to California where Evans was given charge of a parish. Alice started to teach Bible classes where members of all churches except the Roman Catholic attended. Their second child, Mildred, was born in 1912 and then they were moved to a new parish where their third child, Ellison, was born. By this time Alice had suffered years of physical abuse from Evans and the parishioners had found out about her ill treatment. Even the Bishop tried to protect her but Evans threw her down the stairs when she was due with Ellison and the baby was very delicate after birth. She had been “a blue baby” with a leaking heart valve. The parishioners thought Evans was going insane and the Bishop sent him to San Francisco to see a physician/psychiatrist. The diagnosis was that the problem was due to a completely uncontrolled temper. So Alice realised that his future was in her hands as she could get a divorce on the strength of the doctor who had looked after her and seen her covered all over with bruises. The Bishop would get Evans another charge only if he behaved himself. The beatings stopped. They moved to a place near Pacific Grove and as Evans behaved he was sent in 1915 to a Montana Church but Alice stayed, moving into a cottage with the girls. By this time almost all of her religious beliefs no longer seemed pertinent to her for everyday living. Alice had to earn money now so she took a job in a sardine canning factory - Del Monte - and learnt to work well with others packing the sardines in cans. However this was a turning point for her and a major spiritual crisis. She was 35. She made her first contact with Theosophy and met two English women with whom she read and studied. Then Alice met two older ladies who had been personal pupils of Madame Blavatsky who taught her much about her main work, The Secret Doctrine. Alice was subsequently able to teach and hold classes. Alice got divorced and then met Foster Bailey in January 1919. He was the national secretary of the Theosophical Society by the end of the year. However they were to find that the management were reactionary and old-fashioned so eventually there was a split. Alice had never before been involved in an organisational row and found the whole thing most upsetting and difficult. In November 1919 when the children were at school Alice went onto a hill and sat down whereupon she heard a clear note of music sounded from the sky through the hill and in her. She then heard a voice asking her for help in writing some books but Alice refused and responded that she was not a psychic. She was then told that she had a peculiar gift for higher telepathy and what she was being asked to do involved no aspect of the lower psychism which she abhorred. Alice was told that she would be contacted again in three weeks time. At the next “meeting” she agreed to try for a few weeks and the first chapters of “Initiation, Human and Solar” were written. Alice makes very clear that this was not automatic writing in a state of negativity which she was convinced could be very dangerous. Rather, Alice had to listen and then write down what she heard in an active state of very positive awareness. However the experience made her scared for her health in the future and so she stopped doing the work. She was then told to contact her Master who, when she did so, told her that she was in no danger and had the opportunity to do a really valuable service. Indeed, Alice was told that it was in fact the Master Koot Humi who had suggested to the Tibetan that she could be of help. Alice then agreed to become the amanuensis and secretary for the Tibetan, the Master Djwhal Khul (D. K.) although she belonged to the ashram of the Master K. H. - as had D. K. himself. Reassured, Alice then resumed the work that would take the rest of her life to finish. 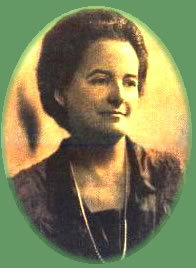 The first few chapters were printed in “The Theosophist” in Adyar, India and ultimately her technique improved so that the whole experience became very much a two way thing between her and the Tibetan as their minds became more attuned. Alice and Foster got married and moved to New York where she began teaching a class on The Secret Doctrine by Madame Blavatsky. She was well qualified to do this work as previously she had been tutored by two old ladies who had been personal pupils of Madame Blavatsky. These ladies took Alice in hand and day after day they taught her. Alice had even moved house in order to be nearer to them. In fact, Mr. Richard Prater, old associate of W. Q. Judge and a pupil of Madame Blavatsky came to her class one day and the following week he turned his entire Secret Doctrine class over to Alice. Later he was to give her the entire Esoteric Section instructions (which had been given to him by Madame Blavatsky) with no strings attached; Alice was free to use them as she thought fit. When he died his entire theosophical library came into their hands. Among the papers which were given to Alice was one in which Madame Blavatsky expressed her wish that the Esoteric Section of the Theosophical Society should be called The Arcane School. It never was but Alice made up her mind that the old lady should have her wish fulfilled and that is how the School came to get its name when she came to set it up eventually in 1923. In 1931 the Tibetan undertook the training of around 45 people for discipleship and the books Discipleship in the New Age Volume I and II are the result. It was in 1943 when Alice inadvertently published a paragraph in the Beacon magazine (which she initiated with Foster in 1922) in which the Tibetan speaks as a Master that his identity became public knowledge. The World Goodwill movement was begun in 1932. Meditation with Triangles was also inaugurated. Alice continued to work on the Tibetan’s books each day, getting up at 4 each morning for some thirty years in total until they were finished. Thirty days later Alice A. Bailey died in hospital in New York on December 15th 1949 when her own Master, Koot Humi, came for her as he had promised her long ago. A new cycle of work without the limitations of the physical plane was begun.